Basketball news: Will the Czech Republic miss Zuzana Gujaraidze? At the moment the basketball news is dominated by the action at the FIBA World Championship for men and the preparation for the women's event coming up in the Czech Republic later this month. Zuzana Gujaraidze (Klimesova) (left) retired from playing international basketball for the Czech Republic in 2006. As she once told us these days she would play basketball for fun. She turned back the clock with a super display with 20 points, 9 rebounds and 5 assists as Reims BF beat Illkirch-Graffenstaden (80-57) in the opening game of the season. 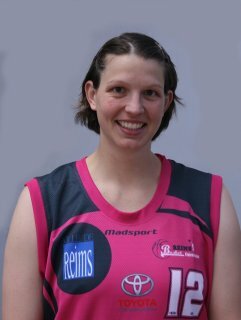 She was joined by Floriane Herrscher also with 20 points. Reims BF did the damage during the first 20 minutes (47-28) and then paced themselves to victory. Lyon BF's ambition this season is to finish first during the regular season, so that they can host the final four and gain automatic promotion to the LFB. They started the season on a perfect note by beating Voiron (74-57). Géraldine Bertal led Lyon with a big display in the paint with 20 points and 7 rebounds. Lyon had to wait until the final 10 minutes (50-48) before securing their victory. As the biggest surprise of the day came that the students from Angers won against Armentières (59-49). Angers that were playing at home led practically from start to finish. They only fell behind once for 37 seconds during the opening minutes. Aurélie Besson and Elise Vieira led the scoring with 11 points each. However all the players from Angers got on the score sheet. Le Havre required 10 minutes to wake up against the CFBB (17-18) and then cruised to victory (72-39). Roche Vendée had to dig deep to beat a new look Pleyber-Christ (73-67) although Naignouma Coulibaly, the rebound queen of the second division, did not play. Dace Brumermane is back at Dunkerque after having had a baby. However it was a balanced scoring for Dunkerque that overcame Nice on the road (72-64). Elsewhere there were no upsets with Rennes and Limoges beating LF2 newcomers Pau Lacq Orthez and Perpignan respectively.